As the world's 'Big 4' central bankers share a stage in Frankfurt this week, the theme of synchronised global monetary normalisation may be apparent. This could add to the US dollar's troubles, with waning tax reform sentiment, NAFTA renegotiations and subdued US inflation data also headwinds this week. Theme of the week: Will the 'Big 4' Central Bankers talk in sync? The Great Monetary Convergence looks to be in motion with synchronised global growth set to continue in 2018 – and this is broadly negative for the US dollar. Whether it is a matter of coincidence – or behind closed doors coordination – major central banks look to be simultaneously taking steps to normalise monetary policy. We prefer to think that synchronised global growth underpins the logic for synchronised monetary normalisation; we may well see such references when the world’s ‘Big 4’ central bankers (Draghi, Carney, Yellen & Kuroda) share a stage in Frankfurt this week. 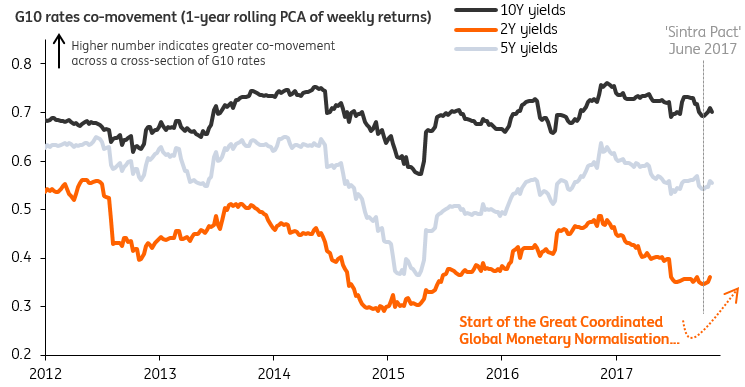 Greater synchronisation in global yields – at both the short and long-end – makes for relatively boring G10 FX markets. Global bond markets have been showing signs of greater comovement since the 'Sintra pact' - when major central banks appeared to simultaneously turn more hawkish (see chart below). In this environment, policy divergence trades will be harder to come by – and investors may have to extract relative value by asking questions like who will be first to hike out of the RBA or RBNZ and Riksbank or Norges Bank. One thing's for sure: the USD will be the biggest loser from the Great Monetary Convergence given that the room for further normalisation is greater in countries outside of the US. ​Odds of a successfully implemented US Tax Cuts and Jobs Act (TCJA) still remain trivial as there isn't enough political buy-in and the Senate math doesn’t add up. While the House may vote through their version of a Tax Bill this week ahead of the week-long Thanksgiving recess on Friday, the real political test is in the Senate – where the narrow (52-48) majority makes it pretty difficult to pass a bill that has clear winners and losers. It's not just the fiscal hawks that we're concerned about – note that the Senate has stricter budget procedural rules, which the current version of the Senate's TCJA does not meet. But it's also the GOP moderates that may take issue with the regressive nature of the package – especially wholesale spending cuts to fund corporate tax breaks. Add to this a (hidden) export subsidy on intangible income in the Senate's bill - which would be explicitly against WTO rules - and we could see the wheels continue to fall off this week when it comes to US tax reforms. A subdued US CPI release this week (Wed) could test the 90% probability of Dec Fed rate hike priced into markets. We'll also get PPI data (Tue), as well as retail sales (Wed) - the latter expected to come in much flatter on the month after last month's strong hurricane-distorted figures. 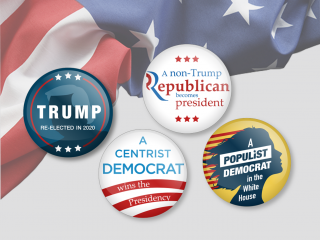 While the 'Big 4' central bankers will also see Yellen speaking this week, the greater focus will be on US politics, be it US tax reform or trade. This week should see the House trying to pass its own version of the reform, though the more tricky Senate vote may not be seen until December. On trade, this week will see the fifth round of NAFTA talks taking place, with early signs that the US and Mexico are starting to lose patience with each other. An equity correction may be coming – but it is not obvious. DXY breaking under 94.25 would worry the bulls. It should be quite a good week for EZ activity data, with 3Q17 GDP for the region being confirmed at a healthy 0.6% QoQ tomorrow. We’ll also see what German Bund yields make of Draghi’s speech tomorrow in Frankfurt. Could it be another Sintra-like moment? Our debt team do feel Bund yields are biased to the upside (there is heavy debt issuance of €25-30bn this week), but it is not clear Bunds can push through 0.50% just yet. Nonetheless, Bund yields could provide the EUR with a lift; we favour EUR/USD edging back to the 1.1725/35 area this week (support at 1.1600). Our USD/JPY profile is neutral largely on the back of better US activity data and the ongoing Fed hiking cycle. But there are growing risks of a short, sharp correction in global equity markets - meaning the risk of a brief retest of 110 before year-end. Signs of global risk being taken off the table this week could keep JPY supported. Our economists note that Japanese 3Q GDP date this week (Tue) is due a pullback from the 2Q surge. We are looking for only a 0.9% annualised growth rate, down from 2.5%, and a little lower than the consensus 1.5%. But absent a negative figure, trend growth in Japan will remain on a decent trajectory. This volatility is just noise and shouldn't invoke greater BoJ easing sentiment per se. While Governor Carney will feature in the star-studded panel of central bank speakers in Frankfurt this week (Tue), we doubt that the BoE chief will attempt to actively talk markets up when it comes to the timing of the central bank's next rate hike. It is understandable as to why the MPC are reluctant to show their policy hand amid what is set to be a crucial few weeks of Brexit negotiations - and while we do think the dovish repricing of BoE policy expectations in markets has been a tad excessive, it will be up to the data to do the talking. This week's UK data splurge – which includes the latest CPI (Tue), jobs and wage growth (Wed), retail sales (Thu) – is unlikely to be game-changing for the overall policy outlook, although some positive surprises (especially on the wage growth front) may see sentiment for a second rate hike in 2018 resurface. The Brexit rollercoaster is set to continue as we countdown to the pivotal 14-15 Dec EU summit. After setting a two-week deadline, the EU's chief negotiator Michel Barnier has made it clear that the ball is in the UK's court to make some headway in settling the divorce bill. Domestic politics continues to focus on Theresa May's leadership after the Sunday Times reported that 40 Tory MPs are ready to sign a letter of no confidence in the Prime Minister (still short of the 48 threshold needed to trigger a leadership contest). Equally, we may see further leaks related to the Chancellor's Budget (22 Nov); while Philip Hammond's hands will be tied by weaker OBR growth forecasts - as well as higher inflation forecasts that increased debt-servicing costs - any growth gimmicks may lend itself to a steeper UK rate curve and some GBP support. AUD: Can 3Q wage data revive lost inflation sentiment? While there were hints of a more cautious outlook in the Nov RBA policy statement, the key takeaway for us is that 'lowflation' looks to be embedded in the central bank's macro projections.The downward revisions to the inflation profiles (both headline and core) are quite striking on the surface of things - though we acknowledge this may be pre-empting a forthcoming update to the CPI basket weights. Still, inflation is expected to remain below the mid-point of the 2-3% target rate over the forecast horizon - which questions the rationale for any near-term policy tightening. Our house view for a 2Q18 RBA rate hike looks at risk of being pushed back. The Oct jobs report (Thu) will be closely watched, but we also expect strong focus on the 3Q wage index (Wed) and Nov consumer inflation expectations (Thu). Any upside here may revive some inflation sentiment in AUD markets. In this scenario, we could see AUD/USD recover meaningfully above the 200-dma (which comes in around the 0.77 handle). After an eventful month for the kiwi dollar, the week ahead should provide some relative calm - with only second-tier manufacturing PMI and 3Q PPI inflation data to note (both Thu). The RBNZ last week batted away concerns over the government's proposal for a switch in the central bank's mandate to include a full employment objective; official estimates show that the output gap is close to zero, with the RBNZ, in fact, bringing forward their estimate for the first hike to 2Q19 (versus 3Q19). The reality is that it'll probably be a lot earlier than this - with market pricing for a 4Q18 hike about right in our view. The external environment should remain fairly conducive in the near-term, especially if waning tax reform sentiment continues to weigh on the USD. We see greater risks for a move back above 0.70. With sentiment over a Jan-18 BoC rate hike still mixed (markets are pricing in 40% odds), this week's Oct CPI report (Fri) will dominate the domestic agenda. Governor Poloz's latest speech defended the central bank's optimistic inflation projections - which continues to primarily attribute the deviation from target to "other" factors. With the lagged effects of the summer CAD rally also to factor in, the inflation outlook is set to get worse - before it gets better. The macro fallout from tighter local financial conditions should keep the BoC on hold in 1Q18, meaning that some trivial CAD downside is still likely. Providing support to CAD has been the rally in oil prices. Yet, actual upside may be limited for 2 reasons: (1) the correlation between Petro FX and crude is weaker under supply-driven oil shocks; and (2) Western Canada oil hasn't moved as much as Brent or WTI. NAFTA renegotiations also resume this week, though the noise may be more of a concern for MXN markets (rather than CAD). We believe the OECD PPP fair value estimate of 1.27 will serve as a medium-term anchor point for USD/CAD - and retain a neutral bias around here. Eurozone politics stands to put a lid on EUR/CHF over coming months. We're less concerned by the Catalan story, but see the scope for Italian opinion polls ahead of likely March elections to occasional heighten Eurozone risk. The domestic calendar is light, with only producer and import price data due this week (Tue). SNB official Maechler also speaks (Thu); in our view, the Swiss central bank lines up with others (Riksbank and BoJ) awaiting tighter monetary policies overseas to generate weakness in local currencies. The key data point of the week is the Sweden Oct inflation (Tue). We expect a correction lower as the energy-related base effects and erratic factors contribute to a decline in prices. Although this may translate into a knee-jerk reaction in EUR/SEK higher, this should be limited and short-lived given that a decline in CPI is a consensus view. With EUR/SEK trading somewhat rich vis-à-vis its short-term financial fair value, we see an upside to EUR/SEK as very limited, with valuation (both short- and medium-term) providing a cushion to SEK. The Sweden Oct unemployment rate (Thu) should have a non-negligible effect on SEK. We expect Norway 3Q GDP figures to show that the recovery from the oil price shock is continuing. This should be NOK supportive, particularly in the context of NOK not benefiting from the recent spike in the oil price and EUR/NOK thus trading rather rich versus its oil price implied fair value. With the EZ data calendar being fairly muted, the key driver of the cross will be the Norway GDP.